After two weeks in Ohio, Kim and I were pleased to move on to new territory. We leaped across the northwest corner of Pennsylvania and set up camp near Niagara Falls, New York. Kim had never visited New York before this trip. And although I’d been to New York City a couple of times, I hadn’t seen the rest of the state. As a result, we didn’t know what to expect. Turns out, New York is pretty darn awesome. The northwest corner of New York is filled with rolling hills and farmland. It’s mostly rural with a few medium-sized cities — Buffalo, Rochester, Syracuse — thrown in for good measure. The area is also an up-and-coming wine-growing region, particularly the land around the long and narrow Finger Lakes. Because of this, we decided now would be a good time to test out Harvest Hosts. We have to be self-contained. That is, our RV can’t require connections to water, sewer, or electricity. We have to support the place we stay by agreeing to purchase some of their wares. If we stay at a farm, we might buy veggies or eggs, for instance. If we stay at a winery, we buy wine. Kim and I joined Harvest Hosts while we were in Arizona last April. We love the idea of it. Because we buy (and drink) a lot of wine, this is essentially a way for us to find free camping. We hadn’t had a chance to use the service, however, until reaching New York. 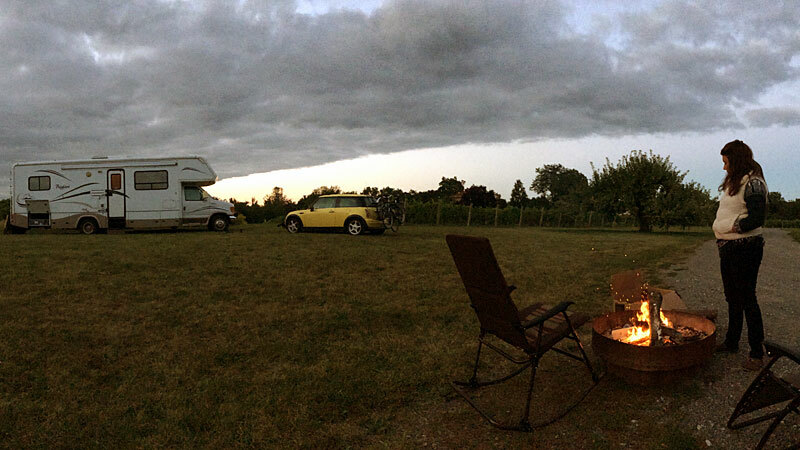 As we left Ohio, Kim contacted a couple of wineries through the Harvest Hosts website. 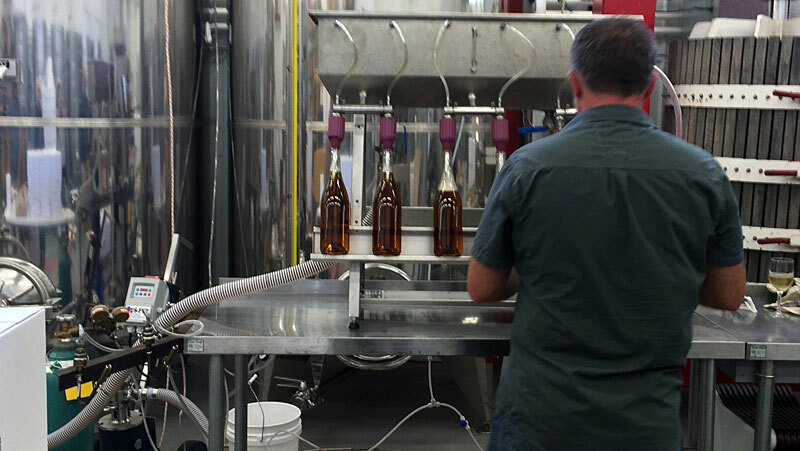 The first to get back to her was Freedom Run Winery, located about half an hour from Buffalo, New York. We had a great experience. First, the staff was almost as laid back as we were. Larry, the owner, invited us to stay not just one night, but two or three if we wanted. After he decided we ought to have a fire for ambience, Larry brought us paper and wood and a torch to build one. Second, Freedom Run has great wines. Kim and I can be fussy about the wine we drink. She grew up in central California wine country, and I’ve learned to love Oregon pinot noir and sparkling wine. On this trip, we’ve tasted wine in several states but have mostly been disappointed. The Midwest, especially, has lousy wine. (And for some reason, folks in Wisconsin and Michigan grow and love fruit wines. To each her own, I guess.) After months of mediocre wine, it was great to find a place that produced the sorts of wines we love. We didn’t just buy one or two bottles at Freedom Run; we bought almost a full case. We used Freedom Run as our base for a couple of days while we explored the area. One morning, we packed up our bikes and crossed the border into Ontario, Canada. 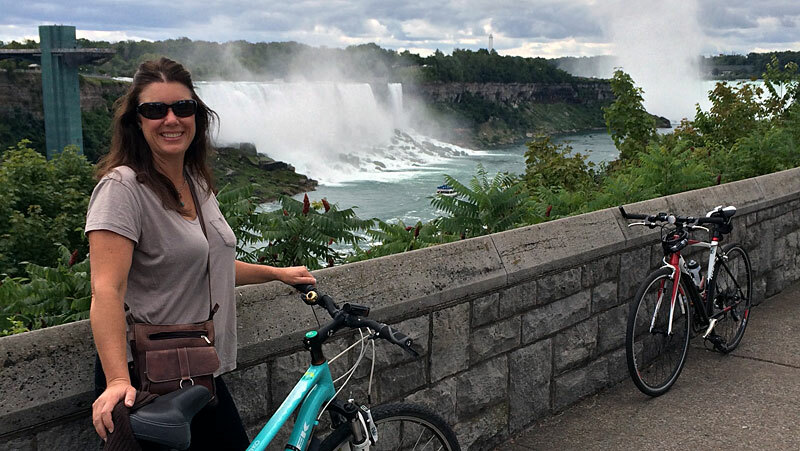 There we parked the Mini Cooper and cycled through town, following the Niagara River up to the falls themselves. We were fortunate to visit on a day with amazing light. Seriously, the photos we took here might be the best we’ve captured on this trip. We were also pleased to spend an evening with Roy and Sue, a couple we’d met while camping near Canyonlands National Park in May. When they heard we were in the area, Roy and Sue motorcycled up from their home in Mount Morris to have dinner with us in Lockport. Larry at Freedom Run made us reservations at Danny Sheehan’s Steakhouse, where we had a delicious meal — and leftovers. Although Kim and I wanted to stay longer at Freedom Run, we decided it was time to move on. Over the previous couple of weeks, our motorhome had begun to exhibit a variety of problems and we wanted to get them fixed. We drove east to Rochester. There, we bought parts and tools to make several repairs ourselves, and we left the RV with the folks at Camping World to address the problems that were beyond our capabilities. In the process, we solved (we hope) a mystery that has plagued us for months. You see, I bought new tires for the Mini Cooper last autumn in Portland. I expected them to last twenty or thirty thousand miles. In Moab, Utah, however, we discovered the rear tires were almost bald. We had to replace them after only two months on the road. Then we had to replace them a month later while we were in Montana’s Flathead Valley. Then we had to replace them again two months later in Cleveland. The Camping World mechanic shook his head when he saw the tow bar. “You’ve been towing this way for 10,000 miles?” he asked. It was clear he didn’t believe me. “I’m surprised you haven’t lost the car already.” He showed me what he meant. When I took the tow bar apart and put it back together in March, I’d done it correctly — except for two pieces. I’d mounted a couple of brackets 180 degrees from where they ought to have been, essentially flipping them upside down. As a result, the tow bar was sliding in and out of its mount. I thought it was supposed to do this, to provide some “play” as we went around corners. Nope. Not supposed to do that at all. Instead, the tow bar is supposed to lock in place, firm and secure. 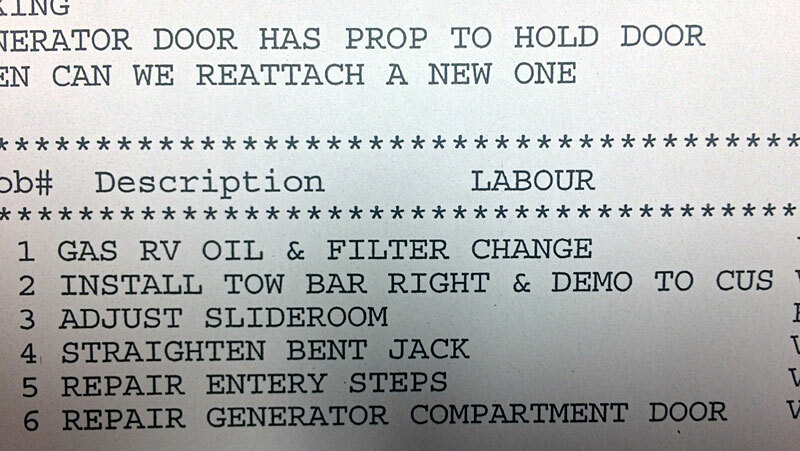 And that, my friends, is why I’m not a mechanic. After the RV repairs, we dove deeper into New York. Initially, we’d planned to spend several days exploring the wineries around the Finger Lakes region. But in a move uncharacteristic of the Rothwards, we bypassed the area and instead made our way to Cooperstown. Cooperstown is famous for a couple of reasons. First, it was founded by William Cooper, father of the famous novelist James Fennimore Cooper, who used this area as basis for many of his books, including The Last of the Mohicans. Second, Cooperstown is home to the Baseball Hall of Fame. 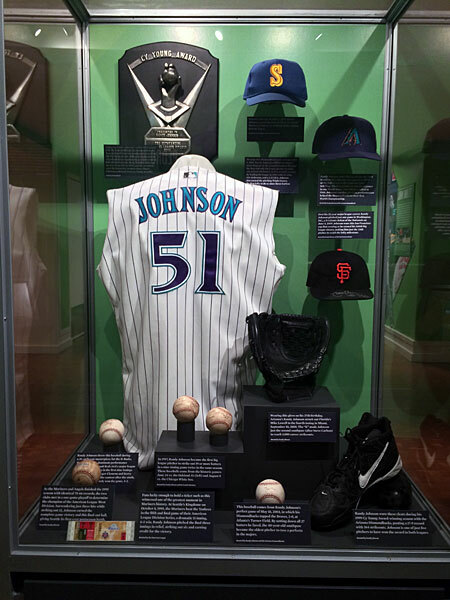 Randy Johnson is in the hall of fame! Actually, the most enjoyable part of visiting Cooperstown was the surprising Farmers’ Museum. This attraction had far fewer people and much more interesting exhibits than the Baseball Hall of Fame. The main building offers displays about different crops and farming methods. But the highlight of the museum is the historic village and the living farmstead. Some of these buildings have been arranged into a small, operational farmstead. Here, volunteers (or employees?) grow flowers and vegetable crops. They raise cattle and horses and chickens and pigs. And the best part of all this? The public is allowed to wander in and among the buildings and the farm, to interact with the animals and the people who tend to them. It’s a lot of fun! Re-reading this, it sounds as if Kim and I spent a couple of weeks in New York. We didn’t. We spent only six nights, and we saw only a small part of the state. But what we saw, we loved. In fact, we’ll probably return to see more of the area before this RV trip is done. Now, though, it’s time to move on. Who knows where we’ll end up next? Glad you got to visit my neck of the woods – Live about 10 miles from Mount Morris and am a principal nearby. I’m sure your friends filled you in on Letchworth State Park – it can’t be missed as you come back through. We went to the Farmer’s Museum several times in the few years we lived in New York. Always with visitors who went to fast. I wanted to LIVE there!